Welcome to our review of the Wildgame Innovations Halo XRT Laser Rangefinder. This rangefinder came to my attention almost by accident, since I hadn’t heard of Wildgame Innovations before. 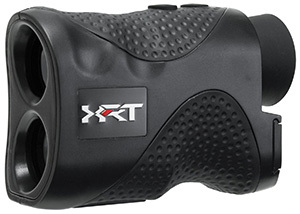 It’s an inexpensive laser rangefinder with a stated range of up to 500 yards. How well it performs, though, is another question. Let’s try to answer that question. The Wildgame Innovations Halo XRT Laser Rangefinder has a stated range of up to 500 yards, and magnifies the image by 6X. Wildgame Innovations says the range is accurate to plus or minus one yard, a fact that I tested rigorously to verify. I can say that the rangefinder is certainly accurate to within a yard for ranges up to 400 yards, the maximum distance at the shooting range where I tested the Halo XRT. How Easy is the Wildgame Innovations Halo XRT Laser Rangefinder to Use? This rangefinder is mostly easy to use, but you have to focus and zoom using the eyepiece. 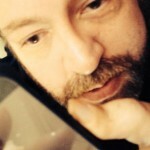 It would be nice to have an automatic zoom or zoom buttons on the device, but c’est la vie. The power button and rangefinding button are easily depressed, and the device is compact and easy to hold. One major drawback to the Wildgame Innovations Halo XRT Laser Rangefinder is that you sometimes have to take multiple readings to get an accurate reading. Many times, I found myself needing to aim at different objects or places on objects at the same range in order to get a reading. Another failure of the Halo XRT is in its use of a black font on the LCD display. When you try using the rangefinder in low light conditions, you’ll discover that the black font is impossible to make out. How is the Wildgame Innovations Halo XRT Laser Rangefinder Powered? The Wildgame Innovations Halo XRT Laser Rangefinder is powered by a single CR2 lithium battery, which is not included in the box. Battery life is quite good, as long as you remember to turn the rangefinder off when you aren’t using it. What Features Can I Expect From the Wildgame Innovations Halo XRT Laser Rangefinder Rangefinder? The Wildgame Innovations Halo XRT Laser Rangefinder offers up to 6X magnification, a single operational button, and a lightweight ergonomic design. The rangefinder features a scanning mode, which takes multiple readings continuously for ranging to moving or multiple targets, but this feature does not work reliably. The Wildgame Innovations Halo XRT Laser Rangefinder comes with a nylon case and a neck lanyard. What’s the Light Gathering Capability Like on the Rangefinder? The light gathering capability of the rangefinder is quite good, but the device is still next to worthless in low light conditions because of the black font. Wildgame Innovations makes no claim as to whether the optics on the Wildgame Innovations Halo XRT Laser Rangefinder are multi-coated or fully coated, but the light transmission capability of the rangefinder leads me to believe they are at least fully coated. As I said earlier, one of my biggest complaints about this rangefinder is the need to manually focus the image. This can often be difficult for fast-moving targets, making the rangefinder ill-suited for hunters. I would have loved to see this rangefinder feature automatic focus, but that just isn’t the case. How Durable is the Wildgame Innovations Halo XRT Laser Rangefinder? This rangefinder is waterproof and fog-resistant, but it is not fogproof. I noticed during several cold mornings that the lenses would fog up. The case is coated in rubber armor, which provides excellent protection against bumps and falls. I’d call this one fairly durable, but not the best in its class. Thanks for reading this review of the Wildgame Innovations Halo XRT Laser Rangefinder. This rangefinder has some real potential, with its scanning mode and awesome accuracy and range. Unfortunately, its manual focus requirement and the lack of reliable readings makes this rangefinder only truly useful for target shooting. I would not recommend this for hunters. It worked well for a short time. After two uses the retractable broke. After about 8 uses the rangefinder fell off of the provided clip during a hike. I searched for the rangefinder but could not find it. I emailed Halo and they gave a short response stating they do not replace items. I would not buy a Halo rangefinder. If you do, do not trust the provided clips and attachment devices.